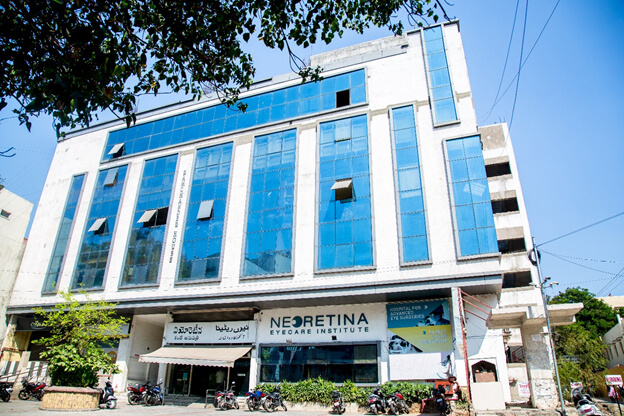 Neoretina Eyecare Institute is located in the heart of the city of Hyderabad and is easily accessible by road, rail, metro-rail and air. It is located conveniently at 100 meters from "Assembly" Metro station, 1km from the Nampally railway Station, 4 km from the Mahatma Gandhi bus station, 5 km from the Kachiguda railway station, and 500 meters from the Public Gardens and Nizam College bus stops respectively. It is easily accessible from the Rajiv Gandhi International Airport via the PV Narasimha Rao Expressway. We have been consistently delivering great results in medical tourism. Our hospital has a very well defined and patient-friendly approach if you plan travel from your country for treatment with us. With quality services and procedures and a specially dedicated International Help Desk, your medical visit will leave you with best results and greater satisfaction. Dilatation of the eye is a pre requisite for examination. The process takes about 45 minutes to 1hour. This must be factored in while scheduling a visit to the hospital. Dilatation of the eye causes temporary blurring of the vision. So it is advisable to have an attender while visiting the hospital. Investigations if any might be advised after the examination. Patients must be prepared to spend some more time at the hospital, the duration of which would depend on the type of investigation planned. The hospital offers day care surgical services with no provision for overnight stay. Arrangements for accommodation within the city must be made by the patients themselves. Although we would certainly recommend few options that might suit your requirements. Patients who have been injected Gas as a part of surgical procedure can travel back by air only after the doctor is satisfied that the gas has been absorbed and it is safe for the patients to travel back by air.